When you are running a business, chances are that your company has a social media presence across the big three; Facebook, Twitter, and Instagram. Of course, there are plenty of other platforms out there that you can use, but these three have the biggest reach and audience. Social media is one of the best ways to grow your business and spread the word about what you have to offer, but how on earth do you keep track of it all? Brand24 is all about social media monitoring, but it has so much more than you think. This could be the greatest tool you ever use, and this review aims to show you why. Brand24 is all about social insights, letting you know what people are saying about your brand in real-time. The access is instant, so you are always in the loop and can see if people are talking about you in a positive or negative sentiment. It’s even more than this though; it’s a smart platform in the sense that you can track individual commenters, give immediate responses, and ultimately prevent social media blow-ups before they occur. It can be used from your office, your home, and even on your mobile phone, allowing you to stay in touch with your customer base no matter where you are. It has the ability to detect sales opportunities, help you discover the best keywords, and ultimately show you how to make your business stand out from the crowd. No matter how big or small your company is, there are huge benefits for you, and this is just the tip of the iceberg. There’s still so much more to uncover. What are the key features that Brand24 has to offer though? This software has so many incredible aspects that will make life so much easier for you when trying to manage your social media. It works across pretty much every platform, including the big three: Facebook, Twitter, and Instagram. Here are all of the key features that make Brand24 stand out from the crowd. This is quite self-explanatory. The mentions feed works by allowing you to see all the discussions that involve your business on social media. You can look at what people are saying to and about you in real-time; so, you can take action quickly. The graph is easy to read, and it can be adjusted so that you can view mentions on a daily, weekly, or monthly scale. The mention analytics link in with the above feature seamlessly. This particular aspect works by giving you a deeper insight into who is interacting with you. It will show you more information about your customers, so you can find out more about the demographic, the things that they like, and the aspects that they aren’t too fond of. This is definitely one of the best features that Brand24 has to offer because sentiment analysis is a fantastic way to discover more about the kind of comments people are making about you and your company. I have a more detailed article on what sentiment analysis is and the way it works, but to put it briefly, it is where you can determine the tone of the comment, as it looks at both positive and negative sentiment. Being able to filter through these comments to find the negative ones mean that you can address areas in your business that need improvement or more work, but also if there are comments that are being labeled as negative when they actually aren’t. This is because sentiment analysis hasn’t quite been able to work around sarcasm, and there are some words that are deemed solely negative because the algorithm cannot always determine context. However, the vast majority of sentiment analysis results are accurate, so it gives you a good reading as to how your company is doing in the eyes of customers. If you want to know if there is a sudden decline or rise in the number of people talking about your company on social media, this dashboard will be able to show you everything. It gives you the chance to see if something good is happening, or if there is an issue you need to address quickly. Additionally, it can help you to boost your own customer service and therefore increase any positive press you are already receiving. You can’t sit staring at your dashboard all day, so Brand24 have a handy alert system to let you know when things start to change, or there is an issue that needs your attention. You can also customise the alerts you receive as well, tailoring them to something that your business actually needs and will find helpful as opposed to standard alerts that might not even apply to you. Being able to keep a record of your social media engagement and analytics is an important part of the job, and exporting the data means that you can ensure there is a digital trail to keep you up to date and so that you can compare past records for increase or decline. You have the data exported into a number of different files, including PDF and Excel. This is a standard feature, but still an important one because there are social media tools that don’t incorporate this. Filtering lets you narrow down your results so that you can look at the specifics in more detail. You can filter according to things like sentiment analysis, mentions, visit number, and other terms like this. An influencer is capable of making or breaking a company, especially if they have a large audience and following. Checking the score means that you become aware of who is out there promoting your brand and talking about it, as well as which influencers you should reach out to so that you can work together. It is often a mutually beneficial partnership, and one that you are unlikely to regret. Later on, we mention that you can track your competitors, but you are able to do so much more than that. 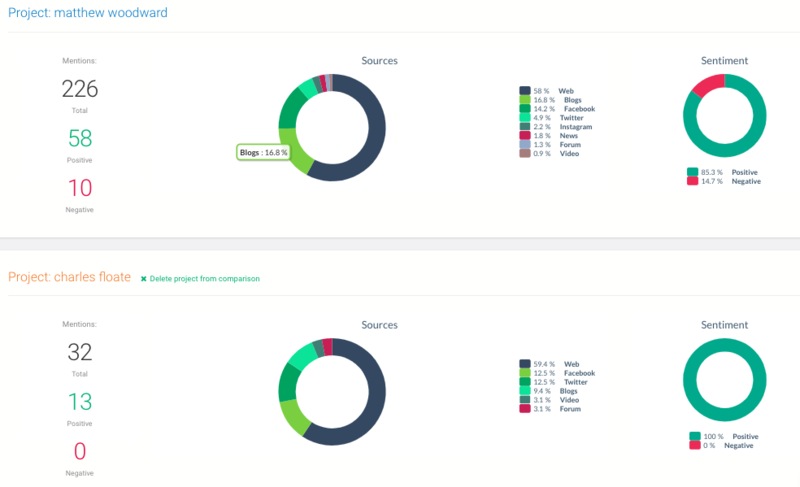 The comparison tab allows you to take up to five different projects and compare them with your competition, keeping track of what is happening both to your brand and theirs, as well as look at the basic statistics and analytics to track any similarities or differences. There’s more though, and this comes in the form of filters. What these do is allow you to narrow things down, comparing results from one source or domain for specifics regards projects or products to see how yours is doing when compared to theirs. You can also track the mentions between companies, looking at the areas where you can improve as well as where you are doing well. Plus, you can take a look at the sentiment behind it. Are people saying more good things about your company than the competitor’s, or is it the other way around? It offers the perfect opportunity to learn more about your customers, as well as keep tabs on the competition. Hashtags are the most powerful part of social media, especially on platforms like Twitter and Instagram. Without them, our reach is massively reduced, and the same goes for using the wrong ones. Brand24 offer both hashtag tracking and analytics on top of the search function, and this will help you to determine which ones you should be using for your company if you want to see your audience and following grow. 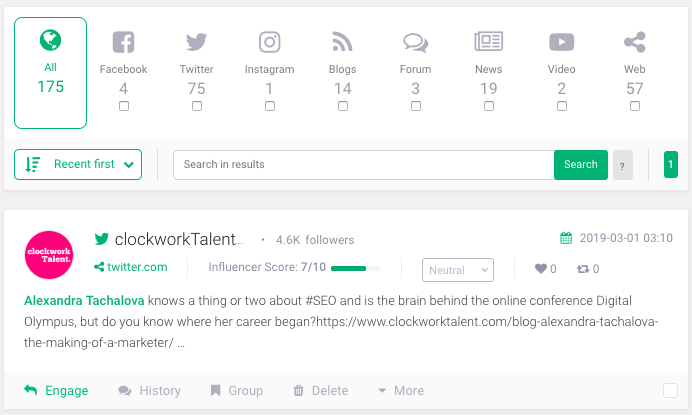 Everything here happens in real-time, and you can set up a project, or your own hashtag tracking campaign, to find influencers, competitors, check your influencer score, and measure the social reach that each of them has. You can analyse the popularity of each hashtag that you use, monitoring how frequently it is used as well as the amount of engagement it has across platforms. The tracking will provide you with regular reports, each of which can be exported into a PDF or Excel file. After typing your desired hashtag in, you can then estimate the social reach it will yield for your business. You can even use it to reach the biggest profiles on social media, looking at who is the best and what makes their profiles so desirable to others. The dashboard itself is also very easy to access and use, with all the data clearly laid out for you to browse through. Knowing what your competitors are up to and how they are doing can benefit you massively. It shows you what kind of mentions they are getting, allowing you to learn from their actions and mistakes, as well as how to make your social media better. You can also use the social search function to identify the latest trends and topics so that you can get involved. All of this, as well as the rest of the features Brand24 offer, lets you detect potential new sales quickly and efficiently. You have the listening tool you need in order to help customers with their research before they buy and convince them that you are the right choice to make. It shows you where to promote products, where to find customers, and how to reach out to them. 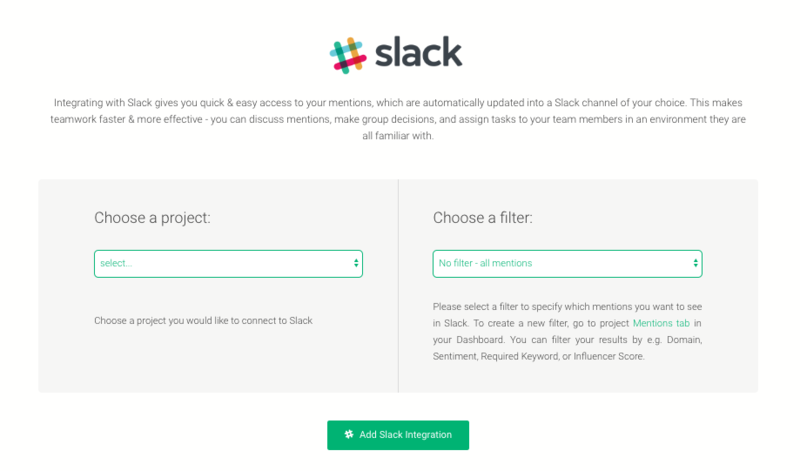 Slack is a popular tool that is used by companies around the world. It’s a cloud-based system that is used for team collaboration and messaging, so that your entire workforce can stay connected at all times; even breaking it down into departments. Brand24 has a superb integration feature that allows it to be hooked up to Slack so that your whole team can see your analytics. The set-up is really easy, and the benefits are huge. Aside from being able to see the usual, so analytics and real-time comments and interactions, you are also sharing that live data with your team. This means that you can assign someone who is fully qualified to deal with any issues that arise as they happen, and there is always someone around who can tackle the problem. Responses and interactions tend to be faster, and all your tools are together. Now that you know more about what Brand24 has to offer, it is also good to learn how it can benefit you; both as a person and a company. While there are plenty of advantages to this software, four of them really make a difference. You are able to see what customers and followers are saying on your social media in real-time, as well as whether or not those comments are positive or negative in tone. The ability to track commenters and keywords live gives you the power to see how people perceive your business at all times. It means that you have the chance to boost customer satisfaction levels and create the ultimate customer experience. Social media explosions happen quickly, and they can start at any time. Tools like this offer you the ability to nip these situations in the bud from anywhere in the world, protecting your name and your company from negative press. It also means that you have the opportunity to show your customers how much you care about them and their concerns. Influencers on social media are an important thing for any brand, and being able to identify them allows you to get in touch and discover new ways to work together. 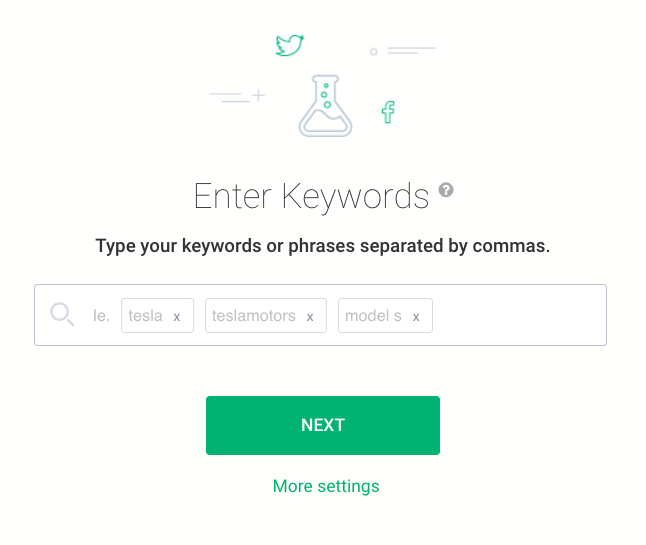 These people promote your brand and brand’s products, and this tool lets you track them to discover which ones have the most impact and the biggest following. The analytics tool lets you take a look at everything from your follower count and number of mentions, to the things that customers react positively to and those that they do not. It compresses all the essential information you need into one place so that you can monitor your progress and influence across all of your social media platforms to see where you stand with your audience, and where you can make changes. As with any software that you are looking at buying and using, knowing the price and what comes with each plan is essential. Brand24 offer a 14-day free trial and then a choice from three different monthly plans, each of which is outlined for you below. If you are searching for the ultimate social listening tool, Brand24 is exactly what you need. While there are plenty of social media tools out there, very few combine as much as Brand24. This doesn’t just have your standard analytics, it also integrates hashtag searches competitor research, as well as sentiment analysis and mentions tracking. It does so much more than you expect it to, and considering all of this, the price is incredible. Is it one of the best tools out there? Yes. Do I give it my full endorsement and recommendation? Yes. If you have used Brand24, or you are considering purchasing it, leave a comment to let me know your thoughts and feelings on this excellent company.